Elon Musk Says He Has 'Verbal' OK To Build N.Y.-D.C. Hyperloop : The Two-Way There's still much to do before getting formal approval, the entrepreneur adds. Hyperloop has the goal of reaching speeds of more than 700 mph, using magnetic levitation in a vacuum environment. The project recently passed a full systems test on the 500-meter Hyperloop One track in Nevada. A plan to build an ultrafast Hyperloop tube train has been given "verbal [government] approval" to connect large cities on the East Coast, tech entrepreneur Elon Musk says. He adds that the system would whisk passengers from New York to Washington, D.C., in 29 minutes. After his tweet about the plan set off intense interest, Musk added a clarification, stating, "Still a lot of work needed to receive formal approval, but am optimistic that will occur rapidly." We're seeking more details from Musk and the Boring Company, which would dig the tunnels for the project. Musk did not specify, for instance, which agency had given its approval or when construction might begin. Engineers who've been working on the project have the goal of sending pods through a tube at speeds of more than 700 mph, using magnetic levitation and an electric motor in a vacuum environment. Musk said the planned Hyperloop underground route would run from New York to Philadelphia and on to Baltimore and Washington — the same heavily used route that is serviced by Amtrak trains. And he added that, as with traditional train stations, the Hyperloop would travel from city center to city center. The stations, Musk added, would have "up to a dozen or more entry/exit elevators in each city." From the start, Musk has made his transportation idea an open-source concept, to spur innovation and competition. 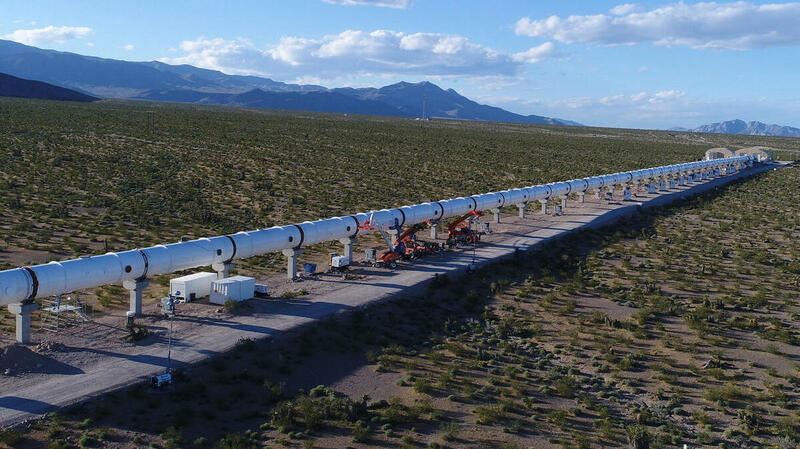 One company that has emerged with real-world tests is Hyperloop One. "With Hyperloop One, passengers and cargo are loaded into a pod and accelerate gradually via electric propulsion through a low-pressure tube," the company says. "The pod quickly lifts above the track using magnetic levitation and glides at airline speeds for long distances due to ultra-low aerodynamic drag." Hyperloop One underwent its first public test last summer, with a successful run at its 500-meter test track in the Nevada desert. It cleared another hurdle last week, when it completed the first full systems test in a vacuum environment. "The vehicle coasted above the first portion of the track for 5.3 seconds using magnetic levitation and reached nearly 2Gs of acceleration, while achieving the Phase 1 target speed of 70mph," Hyperloop One said in a news release. "The company is now entering the next campaign of testing, which will target speeds of 250 mph." Musk made his statements about the new proposal in the same week that he has been in Washington to attend the International Space Station Research & Development Conference, where he was a featured speaker. The Northeast Corridor route Musk outlined Thursday wasn't included in a list of 11 routes Hyperloop One published in the spring. That list mentioned other areas with heavy traffic, including Los Angeles-San Diego, Miami-Orlando in Florida and Seattle-Portland, Ore. Early versions of this story overstated the connection between Musk and Hyperloop One. We've adjusted it to clarify that the company is one of several that pursues the open-concept idea of Hyperloop travel.